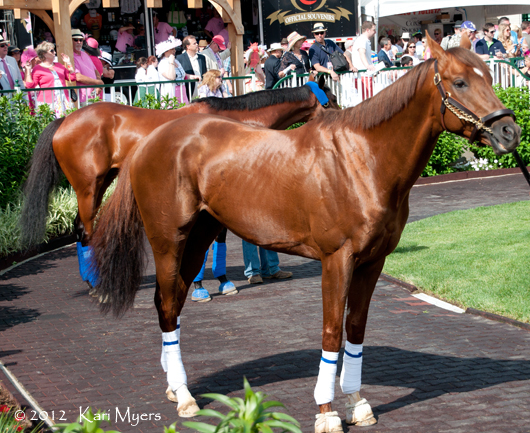 May 4, 2012: Smiling Tiger (front) stops to check out the crowd at Churchill Downs. The mare behind him in blue is the fantastic Switch. One of my favorite things to do during big weeks of racing is watch the horses schooling in the paddock. In May at Churchill Downs, a lot of Derby and Oaks horses will school on the Wednesday and Thursday before the big event. There are so many stakes on the undercards that you may also end up seeing all sorts of big-name horses. They walk over, get saddled, and walk around to get used to the crowd and the chaos. It’s probably true at any track in the US, but it’s particularly easy to catch glimpses of these horses at Churchill Downs because of the way it’s set up. During the early races on each of those days—and even on Oaks day itself—the horses who are schooling are brought over in small groups along with the horses in each race. The last few stalls in the paddock without numbers are used for schooling, so once the horses in the actual race have been saddled and leave for the track, the other horses are free to be saddled and walked around. You never know who will be brought over to the paddock, so keep your eyes peeled between each race! In the photo shown, multiple Grade 1 winner Smiling Tiger (front) stopped to check out the crowd. Behind him is the brilliant mare, Switch, also a multiple Grade 1 winner. On a side note, Switch has since been retired from racing and recently sold at Fasig-Tipton for $4.3 million.